This flyer, submitted by Robert, features just about every kind of punctuation mistake, plus a few random errors thrown in. We've got capitalization and spacing problems, random periods and semicolons, apostrophe catastrophes, and even a misplaced hyphen. Yikes! Someone needs to "recycle" their school days. If you think this is bad, you should visit their website. Horrible isn't the right word. Not only do they repeat all these errors, they commit even more. I wonder how much of this you can attribute to their "web designer". 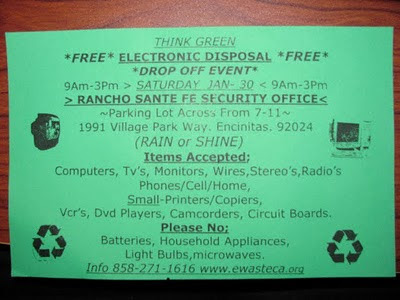 Thank you for choosing Electronic Disposal Group! A representitive will be contacting you to confirm your pick-up.